Cytokines are a major part of the immune system. Their roles are vast and complex. Cytokine function as mediators within the immune system and hematopoiesis, which is the process of creating new blood cells. 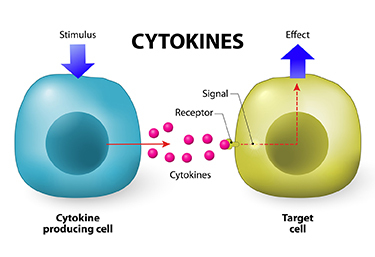 The word cytokine comes from the Greek “Cyto” meaning cell and “kinos” meaning movement. They are a group of small glycoproteins, around 8 to 70 kilodaltons in size, which are secreted by cells of the immune system to allow communication and generate an immune response. This group of cells is divided into many families based on their structures, like interferons (IFN), interleukins (IL), tumor necrosis factor (TNF), transformation growth factor (TGF), and chemokines. The two most common producers of cytokines are macrophages and helper T cells (Th cells) and they influence both innate immune response and adaptive immune response. Following a stimulus, the responding cells will produce cytokines that will activate a receptor on the target cell which will trigger an intracellular signalling cascades and lead to an altered gene expression in the target cell. Differentiation, proliferation, and activation can all be biological effects triggered by this receptor activation. Cytokines have many properties; they can modulate production and action of other cytokines, and they activate cell receptors in different manners like pleiotropism (different effects on different types of target cells), redundancy (multiple cytokines have same effect), synergism (cooperative effect of multiple cytokines), antagonism (inhibition of one cytokines effects by another), or cascade induction (multiple-step feed-forward mechanism to amplify the production of a particular cytokine). They also have a short half-life with very high receptor affinity which makes them very efficient. Cytokine activation only occurs in an antigen-non-specific manner, which means that they must be tightly regulated; otherwise it could be detrimental for the host. In a healthy immune response, cytokines actions are controlled by their production which is stimulated by an antigen. Their half-life is short in extracellular fluids and compartments, and the limited receptor expression on target cells. Many more systems are in place to prevent cytokines from causing harm. However, these systems are not fail-proof. TNF-alpha is a product of interleukin-17 and induces the synthesis of molecules in the liver in response to altered homeostasis. Interleukin-10 (IL-10) is mediates the immune response. When describing IL-10 to clients, it can be referred to as a “braking system” of the immune system. Interleukin-123 (IL-12) modulates effector T cells production and will promote differentiation of Naïve T cell (Th0) into Th1 effector cells. Cytokines play very different roles in the host’s system and balance between types of cytokines is often the goal. As an example, IL-10 balances the action of IL-17.6 These types of give-and-take, push-and-pull actions of competitive, but synergistic, endogenous molecules allows for redundancy in a complex biological system. The immune system is perhaps one of the more complex systems in human biology in terms of the intricacies of interactions. 1.Wang M, Saxon A, Diaz-Sanchez D. Early IL-4 production driving Th2 differentiation in a human in vivo allergic model is mast cell derived. Clin Immunol. 1999 Jan;90(1):47-54. 2.Tisoncik JR, Korth MJ, Simmons CP, Farrar J, Martin TR, Katze MG. Into the Eye of the Cytokine Storm. Microbiology and Molecular Biology Reviews : MMBR. 2012;76(1):16-32. 4. Duvallet E, Semerano L, Assier E, Falgarone G, Boissier MC. Interleukin-23: a key cytokine in inflammatory diseases. Ann Med. 2011 Nov;43(7):503-11. 5. Tabarkiewicz J, Pogoda K, Karczmarczyk A, Pozarowski P, Giannopoulos K. The Role of IL-17 and Th17 Lymphocytes in Autoimmune Diseases. Archivum Immunologiae et Therapiae Experimentalis. 2015;63:435-49. 6. Guo B. IL-10 Modulates Th17 Pathogenicity during Autoimmune Diseases. Journal of clinical & cellular immunology. 2016;7(2):400.